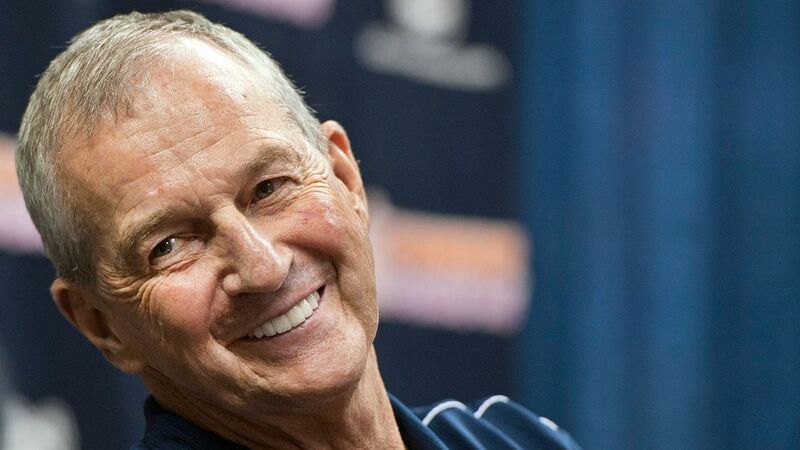 HARTFORD, Conn. — Six years after retiring from UConn, Hall of Fame coach Jim Calhoun was back on the sideline Friday night for the University of Saint Joseph, a Division III school playing its first men’s basketball game. His Blue Jays overcame a 13-point deficit in the second half to beat William Paterson 79-74. And the 76-year-old Calhoun was in vintage form. With his team down 4-0 just 40 seconds into the game, Calhoun jumped from his seat, called his first timeout and loudly sent a player to the bench for poor play. Sixteen minutes in, he picked up his first technical foul. The game was played at Trinity College to accommodate the 1,800 fans who wouldn’t fit into the smaller gym at St. Joe’s. Calhoun, who led UConn to three national titles, took the coaching job in September after being hired a year ago to create a men’s program at the university, which until this semester was an all-women’s school.